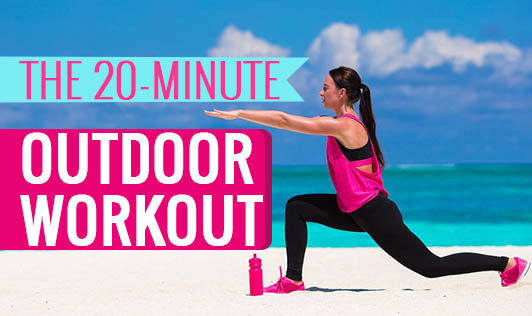 If the only thing standing between you and exercise is the lack of time, this quick 20-minute workout could be just what you need right now. Hop: Stand straight with both feet together. Hop on the right foot as far ahead as comfortable and land on the left foot. Make this activity such that you are able to do 20 reps on each side in 5 minutes. It is a very good workout for inner thighs and quads. Step-ups on a Narrow Plank: Take a log or plank. Step on it and raise the left leg. Come back to normal position, step down, then step up and repeat the leg raise using the right leg this time. Keep your hands near your chest with elbows folded while doing this. This exercise is good for hamstrings and quads. Try to manage at least 20 reps in 6 minutes. Slalom Jump: Place 6 to 7 stones approximately one and half feet apart from each other in a zigzag pattern. If you cannot do this outdoors, you may make small markings on your floor at home. Hop with both legs together and try to land on the outer side of each stone. Turn around and repeat. Do this activity for at least 6 minutes. It is very good for glutes and quads. Hang & Crunch: Find an overhead bar for this workout. Hold it with your palms facing outwards. Keeping the arms fully extended, exhale while drawing your legs closer to the abs. Inhale while lowering legs back into position. Do this for 3 minutes to complete 12 reps.
Now, you needn’t feel that you are missing out on a good exercise session on the days you cannot go to the gym. This 20-minute workout is sure to make you feel active and energized and keep your metabolism running.